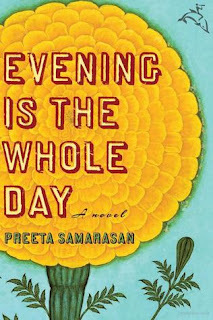 I have yet to meet with Preeta Samarasan, author of Evening is the Whole Day; however, I do have two connections. First, when Lovers and Strangers Revisited beat out Preeta’s Evening is the Whole Day and Tan Twan Eng’s The Gift of Rain for the 2009 Popular Reader’s Choice Awards here in Malaysia, no one was more surprised than me. I thought those two had a lock on the first two places and I was just hoping to sneak into third place. The trophy, by the way, was pretty cool, with the cover of my book on it, so I gladly accepted it. Still I feel those two books — both novels published overseas — were more worthy. Preeta Samarasan grew up in Ipoh. In 1992 she moved to the United States to attend the United World College in Las Vegas, New Mexico. She received her undergraduate education at Hamilton College and her graduate education at the Eastman School of Music (University of Rochester) and the University of Michigan in Ann Arbor. 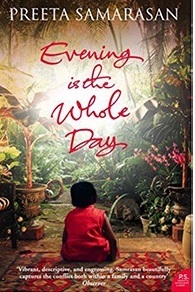 Her first novel, Evening Is the Whole Day, was a finalist for the Commonwealth Writers Prize 2009. Her short fiction has been published in various jour­nals, including Hyphen, Guernica and A Public Space. She won the Asian American Writers’ Work­shop/Hyphen Short Story award in 2007 and was included in the PEN/O. Henry Prize Stories in 2010. She has recent­ly completed a second novel set in Malaysia in the 1970s, 80s and the present day. She now lives in the Limousin region of France with her husband, their two daughters, and a cat named Milo after her favourite childhood beverage. Preeta: I tried out a lot of different structures before hitting upon that one. Of course the first thing I tried was the most obvious and the most common (for good reason — it works well for many stories! ): a simple linear narrative moving chronologically forward. But really I had two stories to tell, the Now and the Then, and I wanted them to unfold simultaneously so that they could inform and colour each other. So pretty early on I realised that I had to alternate between those two time­lines. And then, fairly late into the process of writing the novel, I saw that I would have to tell the Now story backwards, because I really just wanted to show the reader what happens at the end, and I wanted them to keep reading in order to find out why and how. RR: I heard it took you nine years to write Evening is the Whole Day. Of that time, how long did it actually take you to write a complete first draft (no matter how rough that first effort was to get to ‘the end’)? Other than the structure and the time element, what other diffi­cul­ties did you encounter while telling the story over the subsequent revisions? 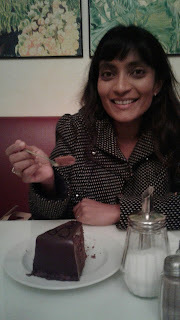 Preeta: This is all so long ago now that I am honestly having trouble remembering all the different milestones! It doesn’t help that I have now, for an equal amount of time, being working on a differ­ent project. But I think that I did not have a complete first draft of Evening is the Whole Day until the end of my time at the University of Michigan MFA program, so that must mean I didn’t have a full draft until year seven….I think the structure was the most challenging thing to figure out; the voice and the plot were pretty well settled from very early on. The only other difficulty was trim­ming all the extraneous material from the draft, because the novel was much, much longer in its first incarnation. I had to decide what to keep and what to discard, and for that I was extremely grateful for the feedback of my excellent editor, Anjali Singh (who is now no longer an editor). I naturally assume people naturally assumed that you’re writing about your family. (I got that a lot from my stories, those with a Western character.) I’m assuming you’re not (based on comments from other interviews), though I’m assuming you can relate really well to these characters perhaps through extended families, friends, neighbors, people in general you’ve had contact with; they all seen believable, this family, their neighbors, as do the trial cases brought up. I was seeing Malaysia through their eyes, a different side than I was familiar with (mostly Malays in Penang and Perak). Did you catch any flack from anyone who insisted that you were writing about your family despite your denials? Any diplomatically way to handle that or did you just ignore them? Preeta: Actually, the reverse turned out to be true, much to my surprise: people seemed not to recog­nise when they were written about. Either that or they were being extremely polite, ha-ha! Perhaps it would be more accurate to say: people chose not to come forward and confront me about the recognisable elements of their lives that had made it to the page. I think it helped that there is no character that is based on a single person from real life. They are, at most, amalgamations. In some cases I took incidents from one person’s life and made them happen to a character who is very obviously not based in any way upon that person. So no, I’ve had no awkwardness of that kind about my fiction, although I have had plenty of it in response to my nonfiction — but that’s another story. The short answer is that one doesn’t always get the chance to be diplomatic. Sometimes, if you write your truth, people are going to be angry. That’s just how it is. RR: I know that anger. I once had five people convinced that I wrote about them in one of my stories about a woman having an affair with a married man in Penang. One woman was par­ticu­larly upset since she thought I was writing about her hus­band (he shared the same name with the character, though he wasn’t Chinese). It started to get ugly until I was able to prove that I had written the story years before I had met them by showing them the original version from Her World. Needless to say, the wife (and the husband) were quite re­lieved….Then an­other woman I only knew professionally was adamant that I was writing about her! I wanted to ask, so which married man are you having an affair with here in Penang? Unfortunately, I don’t think there is a solution other than to radically diversify the gatekeepers of literary culture in the West. Until that happens, Anglophone writers who come from countries without their own extremely profitable, lively publishing industry (by which I mean India) are always going to have to choose between several awful options: 1) write for white people; 2) refuse to write for white people, therefore condemning yourself to an endless struggle with editors not to sacrifice everything you’ve written for your own people; 3) publish at home and give up the dream of a larger, more lucrative career (of course, there are lucky exceptions who’ve published at home and then had significant success abroad, but they are exceptions). RR: I agree there tends to be a “white” or “Western” bias, maybe because they are the ones who are perceived to be buying the most books, having grown up in cultures that support the reading habit. Books in Malaysia are ridiculously expensive, a luxury that far too many Ma­lay­­sians can’t afford, a real shame, something I’ve heard repeated over and over but nothing is done about it. Blame the booksellers, or the tariffs imposed on foreign books, but even the locally produced books for local writers are damn expensive….A huge example of that excep­tion, of a writer writing in his home market, even in his native language, is Brazilian author Paulo Coelho publishing locally in Portu­guese. It wasn’t until a fellow Brazilian living in the US offered to translate The Alchemist into English and was given per­mission to find a US pub­lisher (in essence making him Coelho’s US agent) that his career took off. Books published here in Malaysia/Singapore rarely if ever break out onto the larger market. Like yourself, Shamini Flint published her popular Inspec­tor Singh Investigates series overseas, proving it can be done, that a local writer can find a much larger audience at least for genre fiction which has a different market, of course, than literary fiction. Still it gives local writers hope. You guys, including Tash Aw and Tan Twan Eng, are paving the way…keep it up! Contrary to some reviews, I didn’t see your novel as anyone’s particular story (any more than the other family members); I saw it as a composite of all of their stories as a dysfunction­al family, whereby the whole is greater than the sum of its individual charac­ters. You would weave into everyone’s mind, we would get their thoughts, their comments, their different per­spectives as to what was going on even with the same scene while it was hap­pening; you made the important moments so much bigger, which resonated with me because when I met US writer Bharati Mukherjee in Penang, she told me that I needed to do that, make the moment bigger at the end for my story “Sister’s Room” (about child prostitu­tion). But it wasn’t until I read your book, that I thought, ah, this is what she meant. You had a masterful way of mak­ing your moments bigger by adding all of these different view­points so we got far more out of that scene than if it had been limited to one point of view. Was that something you had devel­oped on your own or something you had picked up as part of your MFA program? Preeta: I suppose I developed it on my own. I don’t see it as a very American aesthetic, and al­though it certainly wasn’t discouraged in my MFA program, it was uncommon in that program, and I suspect would have been uncommon in other MFA programs too. I think what you are talking about has first of all to do with the choice of an omniscient narrator. There is a higher power be­hind the novel, a voice with omniscience and a power of judgment that is almost divine. It’s that omniscience that drives the novel; that, in fact, tells us what to think about each character. It’s in­teresting to think about that choice now because I made a very different one for the second novel — I made, in fact, the opposite choice, an unreliable narrator, a person who doesn’t even know every­thing there is to know about himself, let alone about others. But that omniscient voice I used in Evening is the Whole Day came from my lifelong love for Victorian novels. It’s a very 19th-cen­tury voice, and some people have actually argued that it fell out of fashion because human­ity lost its faith in absolute omniscience. I don’t know if that’s true, but I grew up reading Dickens and Tolstoy, Thomas Hardy, George Eliot; omniscience was my first literary diet, if you like. Virginia Woolf, of course, takes omnis­cience to a new level, and in some ways what she does should be the highest goal of every writer, if not every human being, to be able to slip into another person’s skin like that. It is the very defini­tion of empathy. But I think the narrator of Evening is the Whole Day is modeled more on the bom­bastic, masculine omniscient narrators of those big 19th-century novels than on Woolf’s technique in To the Lighthouse. I’m not sure if I’ll ever write another novel in that exact voice, but the deep commitment to dissecting every character’s motivations is something that has stayed with me, and I think always will. RR: Looking back at your MFA program in the US — the insights you gained from it and the connections that you made with other writers through the program — would you have done anything differently? Also, would you recommend a MFA program for young Malaysian writers (or any writer) just starting out, or do you think they could spend their limited income more wisely by just reading and writing a ton and finding their own natural voice (like Golda Mowe writing about Ibans in Sarawak)? Preeta: If, on a limited income, you can manage to spend all your time reading and writing, then good for you! Then you could certainly do that. But I think it’s actually very difficult to find time to read and write as much as an aspiring writer should on a limited income. You will have a day job, and the reading and writing will both have to be squeezed in after work (when you will be tired) or at the weekends (when you will want to relax). It’s possible, of course; it’s certainly been done before. But it’s very, very difficult, and that’s where MFA programs save a lot of young writers. You should never attend an MFA program if you’re paying for it out of your own pocket. But the best MFA programs basically pay you to read and write for two years. They buy you time, and that is an enormous, magical gift for an aspiring writer. It is the number one reason to attend a writing program: your actual job, for those two years, is to read and write. Of course, all the icing on the cake is lovely too: being part of a community that loves words above anything else, that thinks about language and storytelling constantly and rigorously; being able to talk about books and how they work (or don’t) all the time; having willing readers for your work for the rest of your life; getting to meet visiting writers, who are often among the world’s best living writers; learning about the business of publishing. RR: That’s a great argument. I like what you said, “It is the number one reason to attend a writing program: your actual job, for those two years, is to read and write.” In­cidentally, about meeting writers in Ann Arbor, I was in Borders in 1987 and met a guy who had just published an article that very week about meeting Jay McInerney (Bright Lights, Big City) at the same book­store. A steady diet of that would be good for the writing soul. The Writer, as do other writing publications, periodically runs a feature on the pros and cons of MFA programs; for me, a road not taken. I was on the road so much with Kinko’s man­aging and setting up stores (I set up ten in three states). I had to decide, become a part­ner, which was on the table, or buy myself time to read and write by moving to Malaysia. But it’s not the same by any means — a regret, too. You made the right decision. Hopefully, other Malaysian writers will be inspired to make that decision, too. Did you feel there was any distinct differences on how your novel was received/re­viewed local­­ly (Malaysia/Singapore) versus US/UK? If it was published locally, they might dismiss it as inferior in some way, a general bias against local publishers, perhaps, as opposed to those like yourself being published overseas with well-known publishers­. 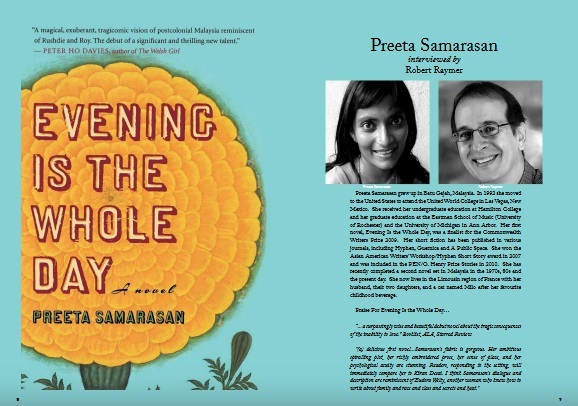 Preeta: I wrote this novel (and I hope to write every novel) for Malaysians. I fought very hard not to sell out, not to have to change things for a Western audience, not to explain, not to compromise. And I did all that not to be difficult, but because I truly believe that it’s impossible to write equally for both audiences. Every step taken towards that Western audience is a step away from my own audience. The ex­plain­ing is not anodyne: in that effort to alienate white people less, you do actual­ly alienate Malay­sians more. The explanations you put in for white people are distancing to your original intended audience. Nothing anyone ever says about being able to do both will ever change what I truly think about this. That said, I had decided to publish that book abroad. That wasn’t be­cause I wanted money and fame and glory, but because I want the West to be reading about Malay­sia, but more than that, I want them to be reading about us ‘on our terms.’ I want them to be read­ing the kinds of stories we tell about ourselves when no one is listening, except I want them to be listening. RR: I like that, the way you put that: “the kinds of stories we tell about ourselves when no one is listening…” That was what I had felt while reading your novel, as if I were eaves­drop­ping on various snide comments and asides not meant for my ears and saw this family in an unflatter­ing, though, natural light. They were being as they are for no one else’s sake but their own. 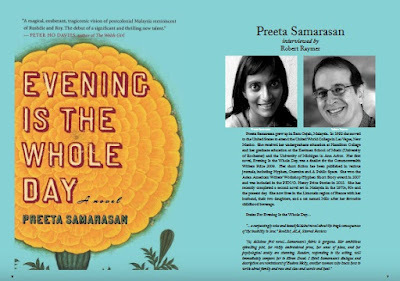 Preeta: That, after all, is the purpose of literature: for all of us, including white people, to be reading about those who are not like us, and to discover even in that not-likeness a shared humanity that underlies every­thing. If we only read about people who are like us in the important ways — by which I mean that their skin colour may be different, but they still don’t ever make us uneasy; we still feel com­fortable in their presence — then the existing balances of power will never be chal­lenged by what we’re reading. I can’t get the West to listen if I don’t publish abroad, so I have to negotiate this minefield each time. Each time, I have to wonder afresh if I will be able to pull it off, if I’ll be able to refuse to address my work to white people, or to hold their hands as I gently guide them through my world, and yet get them to read me. RR: It is a minefield, but it all comes down to the characters and story that demands to be told, demands to be read, not so much where the novel is set, but what resonates with the readers, what they can take away from it, what they can learn about themselves even from a totally different culture, for example, in a Nigerian-set story like Chinua Achebe’s Things Fall Apart, which I recently re-read, whether you are white or nonwhite, whether you are Western or Asian, whether you have an interest in Africa or not...the story stays with you. By the way, were Malaysians or the Indian community, receptive to you writing about the May 1969 riots? Hey, this is between the Malays and the Chinese, you Indians stay out of it! I was here during the October 1987 crackdown which prevented another racial riot — for months we could feel the pres­sure mounting all the way in Penang; then came the clampdown of the press and all those arrests under ISA. My ex-wife was a reporter for NST and they were given new strict guide­lines what they could or could not report on — anything remotely racial was a huge no-no. We had close friends who wrote for The Star when it got shut down; a scary time, but nothing close to what happened in 1969! Preeta: For the most part, yes, people were very receptive. Of course I’m not the first writer to cover May 13th in fiction; most famous, Lloyd Fernando wrote a whole novel about the riots. I can’t claim to have a clear idea of what readers in general thought of my treatment of May 13th, but the few who spoke to me about it were very positive, with one exception (but that person was Malay, not Indian). It’s interesting that you mention Operation Lalang, because the novel I’ve just finished deals with that incident. Preeta: Yes, I finished the book earlier this year and it’s in the long process of (I hope) being sold. Of course the long gap worried me, even as I continued to slog through the writing; I worried I wouldn’t or couldn’t finish it, I worried everyone would have forgotten who I was by the time the second novel made it out (and perhaps they have! ), I worried the second novel would be too differ­ent from the first, so that those few readers who ‘hadn’t’ forgotten me would be disappointed. But in the end you have to set those worries aside and keep working, or risk devoting your life to worry­ing instead of writing. 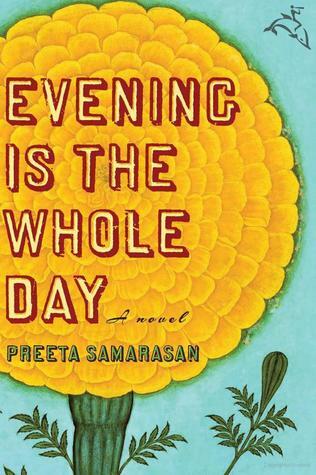 In response to your speculation, I do have to say: this novel is not a sequel to Evening is the Whole Day. It isn’t about an Indian family; it is different in possibly every way (style, struc­ture, tone, voice, point of view as I previously mentioned). RR: Perhaps in the future, after enough time has passed, you’ll consider the idea….Just curious, do you prefer being called a novelist, an author, or a writer? Since we’re on the subject of identify, after having lived overseas so long, do you consider yourself as an expat writer, or a Malaysian writer, or part of the larger India Diaspora of writers? Why? Preeta: I can’t say that I have any strong preference! I refer to myself as a writer, because I also write short stories and essays. But I’m not offended or annoyed to find myself referred to as a novel­ist or an author by others. As for identity: I consider myself a Malaysian writer. I realise that my living overseas means some people will contest this identity, arguing that I can’t be an “authen­tic” Malaysian writer if I haven’t lived in Malaysia for a quarter of a century. But Malaysia contin­ues to be the only place I write about and the only place I want to write about in my fiction. To me, living overseas makes it easier for me to see and to articulate some things about the country that I don’t think I’d be able to if I were living there. I’m speaking only for myself here, and not claiming that Malaysian writers who live in Malaysia are less able to see what I see or write what I write. I only mean that for me, personally, distance is crucial. As for the Indian Diaspora question: I ad­mire many Indian writers, but I don’t consider myself one of them because Malaysian culture is dis­tinct from Indian culture on the subcontinent; South Asia and Southeast Asia are two quite different regions. RR: Distancing is a way that allows you to see things up close….I keep finding myself writing about America even though with each passing year as an expat I know it less and less, but it is still home; it is where I am from; it is what I am still trying to make sense of even more so in this age of Trump with its dis­turbing undercurrent of half truths, blatant lies and white su­prem­acy. Preeta: Yes, I do sometimes I wish I’d made the decision several years sooner, but then again, I don’t think I would have been quite the same person if I’d followed a different trajectory, and a different person would be a different writer. So in many ways, it’s pointless to speculate about these things. The writer I am, the person I am, is the person who had all these experiences, and although I don’t analyse the effect of those experiences on my writing, I can’t help but believe that they exert their influence on my writing in some way. Not at all in the most obvious way that peo­ple always ask about: do you think your musical training plays a role in the way you use language? Because my answer to that question is a fairly certain no. The way I use language comes much more from the writers I read as a child and as a young woman than from anything else. But I think that my years as an academic did give me a certain kind of rigour in my approach to history, mem­ory, and language that I didn’t have before. RR: If you were interviewing yourself, what one question would you ask and how would you answer it? Preeta: I’m terrible at answering questions like this! Every so often I read an interview in which a writer is asked a question I really wish someone would ask me, and then I promptly forget it. I sup­pose I’ll just offer something that’s on my mind right now: lately, I’ve been seeing a lot of positive reviews or blurbs of books that say “This book made me miss my subway stop!” There’s nothing wrong with a good, gripping page-turner, but it bothers me that this has become our one criterion for judging literature. So I think I would ask myself, in this hypothetical interview, what other kinds of pleasurable or important or even life-changing reading experiences there are, and what some examples might be of books that would never have made me miss my subway stop, but changed my life and the way I think. I think that in my long reading history, I’ve found that the book that is a challenge, even an ordeal, to read — the book I have to put aside for days, weeks at a time, the book I have to take a break from every hour or so, the book that is dense and slow and un­welcoming, forbidding, at first — can sometimes be the most rewarding book of all. But how can we do any of this if the only thing we’re all looking for is a book that will make well-meaning middle-class New Yorkers miss their subway stop? RR: Nicely said. I’m glad you answered that very apt question! What one advice would you give yourself (and others) if you were just starting out to write a novel? Preeta: Write the kind of novel you yourself would want to read. Write for a person who already knows and understands the things you know and understand (about the place you’re writing about; about history; about human nature). Don’t explain yourself. Don’t give in to the temptation to take your reader by the hand and make them comfortable. The best books don’t try to be everyone’s best friend. The best books unsettle people, push them out of their comfort zones. Trust your read­ers to do some work. The ones who aren’t willing to are not worth it anyway. RR: I know where you’re coming from, but I feel all readers are worth it. If a reader has invested his or her money and invested their time they are worth it. Some just need to read the book or certain parts more than once. Most books, after a second reading, are richer. Stuff you may have missed or didn’t feel was significant the first time around suddenly made sense in light of what comes later, plus under­lying themes that may have been missed while caught up in the plot can resonate in unex­pected ways, but as you said it does take effort. I do like what you said about writing the kind of novel you want to read. I could add, write the story that only you can tell; if you don’t, it’ll never get writ­ten, a loss for all of us. 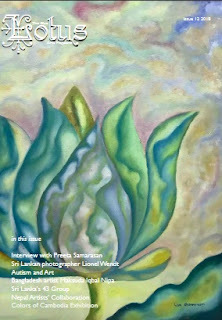 *Update: My interview with Preeta appeared in Blue Lotus 12. Here are some links to order Preeta’s book.